The Conservatives have broken their pledge to ban Lion hunt trophies from being imported into UK. In 2015, then environment minister Rory Stewart said the UK would halt imports of parts of the big cats by 2017 unless the hunting industry cleaned up its act. The following year, his successor Liz Truss repeated the promise in a letter, saying: "Unless we see improvements in the way hunting takes place, judged against strict criteria, we will ban lion trophy imports within the next two years." Experts say there have been no improvements to African lion hunting, and wild populations have tumbled from about 20,000 then to about 15,000. More than 150 MPs have signed a parliamentary motion by Zac Goldsmith calling for a ban on hunting trophy imports. The government says it keeps the rules under review. Chris Macsween of the charity LionAid said she was appalled by the broken promise. "It's awful. The number of wild lions is falling and numbers of Lions bred for canned hunting in the cruel shooting industry is going up, yet it's never on anyone's agenda. It's heartbreaking," she said. 'Orphan' lion cub farms are a scam driving extinction, tourists are warned. An average of six lion bodies are imported each year but LionAid says a ban would send a message worldwide. A spokeswoman for Humane Society International said: "The situation in South Africa, which exports more lion trophies than any other country, is exactly the same as in 2016." The US lists lions as an endangered species, which means imports of body parts from captive lions are effectively banned. In 2015 LionAid twice met Mr Stewart, and Ms Macsween said: "During the second meeting, Mr Stewart told us 'we had won'." Mr Stewart promised in November 2015: "Unless there is a significant improvement in the performance of the hunting industry and of those countries, this government will move to ban lion trophies." Experts say hunting male lions devastates entire prides. Teresa Telecky, HSI's wildlife vice president, said: "Last September, the magnificent Greater Kruger lion, Skye, who was head of his pride and in his prime, was lured out of the national park into a private reserve, where he was shot by an American hunter. "As a result, several of his cubs were killed and some of his pride's lionesses were badly beaten up as new males sought to take over. The lion dynamics in this region were severely compromised." At a rally on 13 April this year, thousands of wildlife supporters will march to Downing Street to call for tougher protections, and for all endangered animals to be exempted from trophy-hunting. Asked about the criticisms, the Department for Environment referred to a statement by minister Thérèse Coffey, who said imports were already strictly controlled. "A permit will only be issued if no detrimental impact on the survival of endangered species is demonstrated and the item has been obtained from a legal and sustainable hunting operation. "We are looking carefully at this issue and plan to hold a round-table discussion with organisations from all sides of the debate to gain a better understanding of the issues as well as consider any further scientific advice." Environment secretary Michael Gove has said the rules are constantly under review but stopped short of saying whether a ban would be considered. 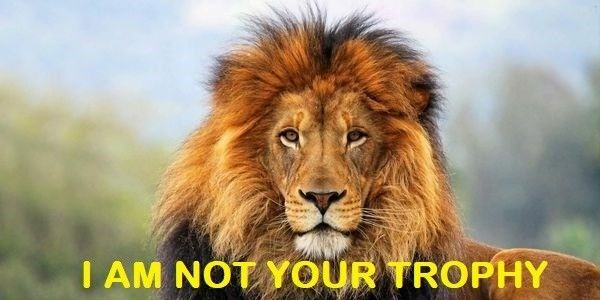 Please sign this petition urging the Government to fulfill their pledge to end Lion trophy imports NOW!